PFC Kenneth von Ronn died January 6, 2005, in Baghdad, Iraq, from wounds sustained when an improvised explosive device (IED) struck the Bradley fighting vehicle that he was riding in. Also killed were SFC Kurt J. Comeaux, SGT Christopher J. Babin, SPC Bradley J. Bergeron, SPC Huey P.L. Fassbender, SPC Armand L. Frickey, and SPC Warren A. Murphy. Kenneth graduated from Pine Bush Central High School in 2003 and set out for boot camp later that year. He was a member of the Trinity Lutheran Church in Walden, New York. PFC Kenneth von Ronn was 20 years old from Bloomingburg, New York. 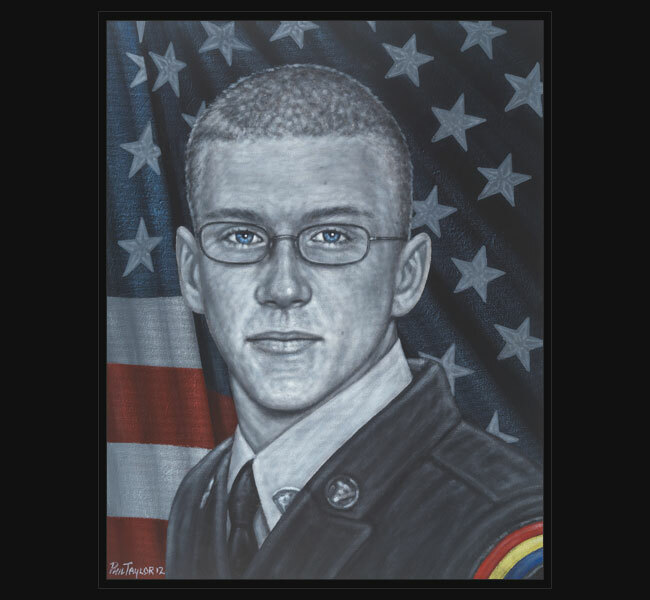 Original portrait was presented March 17, 2012 to his family during the St. Patrick’s Day ceremonies hosted by the 69th Infantry Regiment at their historic 69th Regiment Armory in New York, New York.